Brought to you by the Canadian Mental Health Association, Self Help & Peer Support, this toolkit is designed to address an often-forgotten aspect of peer work: effective supervision. This toolkit is aimed at helping people who are supervising and implementing peer roles to better understand peer support and its unique value proposition for mental health and addiction agencies so that they can support peer workers in unlocking the potential of this nascent profession in our communities. Supervising Peer Staff Roles: Literature Review by Keely Phillips. All three documents can be found here. Most of the supervision needs of peer workers are not unique to the practice of peer support, but are common needs across direct service work in the mental health and addiction system. 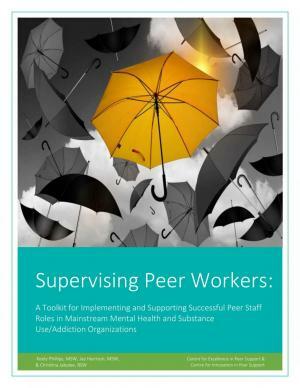 For that reason, this toolkit focuses on providing resources that will help supervisors to address some of the unique issues for peer workers. Click on image below to download the toolkit as a PDF.